The first Oktoberfest event took place in 1810 in the Bavarian city of Munich, Germany. It was held to celebrate the October marriage of Crown Prince Ludwig to Princess Therese of Saxe-Hildburghausen. A notable horse race took place and the event was so popular it eventually became a perennial tradition. In 1887, decorated horse teams of beer breweries became a part of the festival tent scene in Munich, forever linking beer with this fall tradition. In 1910, Oktoberfest celebrated its 100th birthday. There were 120,000 liters of beer poured. In 1913, the largest Oktoberfest beer tent of all time was erected, with room for about 12,000 guests. Americans have replicated in a smaller fashion the tradition of Oktoberfest, including the brewing of a particular style of amber lager, known as Marzen, from the German word for the month of March. "Marzen beer is autumn in a glass," said Sean Flynn, co-owner of the Sun Valley Brewing Co. in Hailey. Like many other brewers around the world this month, Flynn has been at work replicating a style of beer that was made in spring, but kept cool in Bavarian caves until it was finally finished off during the fall celebration of Oktoberfest. Until modern refrigeration methods were developed, lager beers like Marzen had to be kept cool, Flynn said. That's because they are "cold-fermenting," and more perishable than ales. "India pale ale had a lot of hops, which acted as a preservative, so the English could ship it between England and the colony of India," said Flynn, a self-described "beer geek" who operates an industrial sized brewery in downtown Hailey. Flynn speaks Arabic and French and did a stint in the Army as an intelligence specialist during the first Gulf War, later resettling Iraqi refugees for a non-governmental organization. 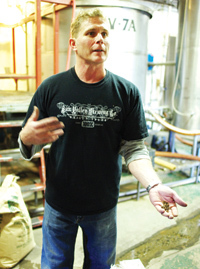 Since 2003, he has been applying his skills to the sensitive and somewhat mysterious process of beer making. "Brewing has been around since ancient times, but the Germans refined it to a science," Flynn said. "Some brewers are very specific and measure everything precisely in their brew logs. I work a little more by feel and by taste." A painted silo on top of the brewery is filled with roasted barley, grown regionally and roasted in Pocatello. The grain is delivered, along with added "specialty grains" to large vats where it is soaked and heated, along with a small amount of hops for bittering. The specialty grains can include barleys that are roasted to "chocolate" and carry dark colors. One Scotch malted barley smells like the peat bogs of Scotland where it is made. After about a day, the "wort," or drippings from this mix, is then transferred to fermenting tanks, where the sweet wort liquid is slowly transformed by yeast fungi into alcohol and carbon dioxide. The fermenting process takes about a week. Marzen-style beers, copper-colored and with a malty aroma, were originally stored in cool underground caves before the warm summer weather rendered fermenting impossible. The beer was drunk all summer until the last of the kegs was finished in fall, just in time for Oktoberfest. "They were once considered high in alcohol content, but nowadays there are many that are higher," Flynn said. His Oktoberfest brew includes Vienna-roasted barley, a chocolate-malted barley from Belgium, and two other ingredients that will go unnamed. After all, a brewer has to have a trade secret or two.